I’ll never forget the day I toed the starting line at my first marathon – the TCS New York City Marathon on November 5, 2017 with Frank Sinatra’s “New York, New York” playing. Years of dreaming and months of training led to that special moment. Four hours and twenty minutes later, I crossed the finish line – an even more incredible feeling. During this, the most crucial item that made the marathon experience exceptional was my racing bib. A racing bib is the number that identifies each participant with a timing chip on the back and it is typically worn on the chest. 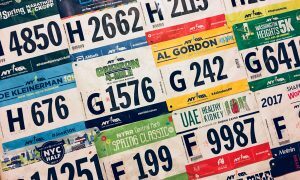 Whether we know it or not, the racing bib is arguably the most important item for both race directors and runners to ensure a successful experience. By understanding its role and the complexities that come with executing a smooth race, we can learn valuable lessons that are applicable to designing good user experiences (UX). #1: Distill and design for the primary function. Then iterate. Orchestrating a race is a logistical nightmare due to multiple moving parts. Sure, the sport itself is simple but organizing the race isn’t. Road racing provides one big purpose: to give athletes a platform to perform their absolute best. The measurement of best performances is time. Before anything, designing an effective and accurate way to capture finishing times was imperative. In the early days of road racing (when it was reserved for “weirdos”), timing was done by hand since participation wasn’t as high as they are today. As the sport became more popular over the years, race directors needed a better solution. The first iteration of an automated timing system was actually not a bib – it was the ChampionChip shoe clip. This solution was a lot more accurate and allowed races to significantly increase their field size. Unfortunately, this came with a catch – runners had to return them. But most forgot so organizers had to constantly replace them, which got expensive. It works for small races but not when participation numbers are high. Instead of hiking up race fees to deal with this, organizers implemented a slightly better solution: disposable chips. These were still accurate time trackers and less costly but they weren’t as durable as the clips, which meant that they don’t hold up through bad weather. This also produced a lot of trash, which is not the most environmental solution. Races already produce a magnanimous amount of garbage and adding to it wasn’t necessary. So, how might race directors take the durability of the clip, affordability of the chip, and still maintain the accuracy of capturing finishing times? Bib numbers. They’re made of a durable material called Tyvek that can withstand harsh weather conditions and keep up with mobile athletes. They contain chips on the back that set off the start and finish mats on a race course. These are easy to apply with safety pins into the holes on each corner onto all types of running apparel. 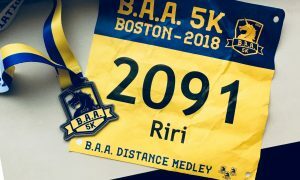 Currently, bibs are used almost universally at road races all over the world and prove to be an effective, inexpensive, and accurate way to keep track of a large crowd of runners. This flow of iterations is a great example of how race directors tackled the problem of timing race finishes, without getting caught up in the interface. It’s important to solve the problem for the most important function in a race. As different types of technology became available and the popularity of road racing grew, so did the time keeping method. Always remember the “why” and do that well. #2: Drive design decisions with business and logistical needs in mind. Bib design plays a huge role in facilitating smooth starts on race day and dealing with logistics. Road races can be as small as a couple hundred runners or as big as tens of thousands of runners (The NYC Marathon field size is always over 50,000!). Regardless of the field size, race directors need an efficient way of releasing runners. Many organizations rely on a corral system to put runners of similar paces together and avoid overcrowded starts. Corral and wave assignments are indicated on bibs to help runners seed themselves correctly at the starting line. The better the design, the easier it will be for runners to know exactly where to go. Bibs could show various colors or numbers that correspond to areas on the starting line. Corral and wave starts are extremely important for runners, especially if they are in the race to chase a personal record (PR or personal best, PB). If those of mixed paces are starting together, faster runners would have to weave through crowds, wasting precious energy. For race directors and organizers, this system alleviates the risk of collisions and other potential hazards and ensures a smooth flow of runners being released. Bib design is also important when emergencies strike. Each bib number is attached to a runner profile with their medical and emergency information, including crucial notes about allergies and other needs. This allows organizers to identify the runner immediately, get in touch with the right people, and get them the help they need. There is also a space in the back for runners to sharpie their emergency contact information and medical needs, further minimizing risk. Since bib numbers are synced up to runner profiles, family and friends can use an app to track them during a race. This way, they can know where to go and get an approximate time for when to expect them to pass. Bibs and runner profiles can also be synced with social media accounts to let everyone know when they hit certain checkpoints. This is just a small part of the ways that bib design impacts race logistics. Although the primary goal of the race bib is to measure time, race directors have found ways to incorporate other elements to make the racing experience better for both runners and organizers. It’s important to not compromise the primary function and work with it. But knowing a wider scope of the business goals can help improve the design and we can see that with the racing bib here. #3: The details in the graphics of the interface matter a lot. I advocate for interactions over interface in design (in circumstances when it’s one over the other), but there’s no denying that visual design of the bib interface matters significantly. The graphics don’t need to be the most beautiful. They should, however, communicate ideas effectively and contribute to the interaction and function. Depending on the typography used, words and numbers aren’t always easy to identify. Therefore, the designers working on a bib needs to be intentional about the font. Legibility is very important. It helps event volunteers, security personnel, and staff easily identify race entrants. Legibility is also important because many races take photos of runners and use a program to auto-detect bib numbers. This makes the process of tagging runners much faster. Race directors know that many runners keep bibs as memorabilia. Therefore, the design of the bib should be different for each race. Before, most races used the same typography to put the number and name of the race, making it difficult to distinguish the races apart and not as aesthetically pleasing when they’re hung up on walls. 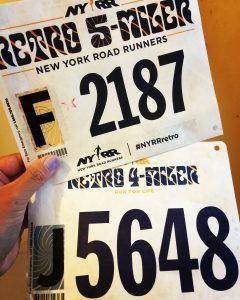 Nowadays, many race bibs are utilizing color and typography to increase the visual appeal. On a more practical level, designs that are unique to each race ensures entrants who specifically signed up for that event. 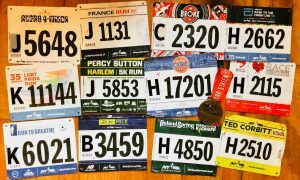 There are organizations that host multiple races throughout the year and they provide runners with just numbers. Simplicity is good, sometimes. But in this case, it opens up the potential for people to reuse their bib numbers at other races when they know the bib will be the exact same. In UX design, people often say that the “devil is in the details,” an expression which implies that the success of a large project depends on the smallest aspects. Simply put: detail matter a lot. The primary purpose of a bib is to ensure accurate time keeping so the visual details in the graphics may not seem like much. Bibs are small, but their role plays a significant and integral part of the whole racing experience. Running is an honest sport. There are no shortcuts to training to get the desired results. But unfortunately, there are runners who still find ways to cheat the system and diminish the integrity of the sport. Marathon Investigation, run by Derek Murphy, is a fantastic site that calls out the cheaters and raise awareness of malicious practices in running. There are people who enter races with fake bibs to avoid paying registration fees (banditting), register for prestigious races only to sell the bibs online at a higher markup (bib swapping), and use bib mules to obtain time qualifiers. Good bib design is essential to discourage this type of behavior in runners, but also make it easy to call them out after races. The practice of banditting seems harmless but it is highly problematic because unpaid entrants are utilizing resources on the course like water stations and medical tents that others paid for, which is considered stealing. Some go as far as grabbing a finisher’s medal. A solution to this is to incorporate elements that make bib photoshopping difficult. Some have holographic and iridescent stickers. 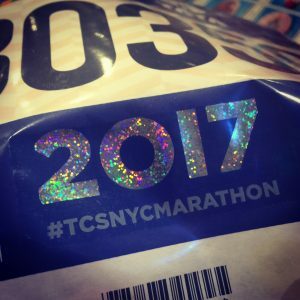 The past NYC Marathon bib has “2017” written in sparkles, making it easier to identify a bib’s authenticity. Race directors are being more intentional about combating bib swapping with good design through personalization. They can include names, age, and gender in visible lettering. Some races also assign bib numbers based on estimated pace – the smaller the number, the faster the runner. Bib swapping also seems harmless but it’s actually a dangerous practice. Giving away a bib is not comparable to buying concert tickets and giving them away or reselling them. Most bib swapping occurs when runners register with intentions to run but need to back out due to injuries or last minute changes. Since refunds are rarely provided and transferring a bib to another runner isn’t always an option, people give them away to not waste the registration fee. A more malicious circumstance is when people buy up bibs for popular races that sell out within hours and sell them online for higher. Either way, it’s a dangerous practice – if a participant has a medical emergency and their bib is under a different person’s profile, imagine the challenges that this scenario could present. The worst practice in road racing though is taking the bib swapping to the next level by having someone else run a faster time to qualify for prestigious races. People might peel off the timing chip and give it to a faster runner in order to record a BQ (Boston Qualifier) time to gain entry into the Boston Marathon. This makes it easy to deliberately cheat one’s way into a race they are unable to earn themselves and race directors must also consider this when integrating a timing chip in a bib. These are not the ultimate be-all, end-all solutions but they are definitely helpful in filtering out the obvious bib swappers. Over the years, I’ve accumulated quite the collection of racing bibs. They’re hung on my wall as a reminder of the obstacles I’ve overcome to accomplish the unimaginable. For race directors and organizers, they play a completely different role. To them, good bib design is essential to facilitate a smooth race and make sure that all moving parts work together as one. A bib may be simple in theory but as we can see, they are an important part of facilitating smooth race logistics and ensuring a great experience for all. By analyzing its role in road races, we can gather a lot of design inspiration and apply that knowledge to other complex problems. There’s still a lot of potential for improvements and race directors and organizations should be intentional about designing better iterations.